One of the things that I love about the herb rosemary is how easy it is to grow. Place the pot in a fairly sunny location and water when dry and bam, you’ve got beautiful and tasty rosemary. Since rosemary tends to grow like a weed, it’s easy to find yourself with a bumper crop of greens. If you want to use the herb in its fresh form, you can store it in the refrigerator for three to four weeks. If you’d like to keep it on hand for even longer, you can store it in the freezer for several months. Since rosemary seems to complement chicken like jelly does peanut butter, you’ll find quite a few recipes combining the two (rosemary and chicken that is, not rosemary and peanut butter 😉 ). In today’s recipe, we’re taking your bumper stock of rosemary and adding it to economical chicken thighs with a bit of lemon. Next, we’ll sauté some shallots and add chicken broth to form a nice sauce. Throw in a bag of frozen broccoli and you’ve got yourself a one pan, six-step meal. Easy meals are my favorite. Especially on a weeknight. Since this is a one-pan recipe, there will be fewer dishes to clean up afterward. Cause washing dishes is fun said no busy working person ever. Download a copy of the recipe here====>6 step lemon rosemary chicken. Just look at that tasty sauce! I’m hungry. Are you hungry? 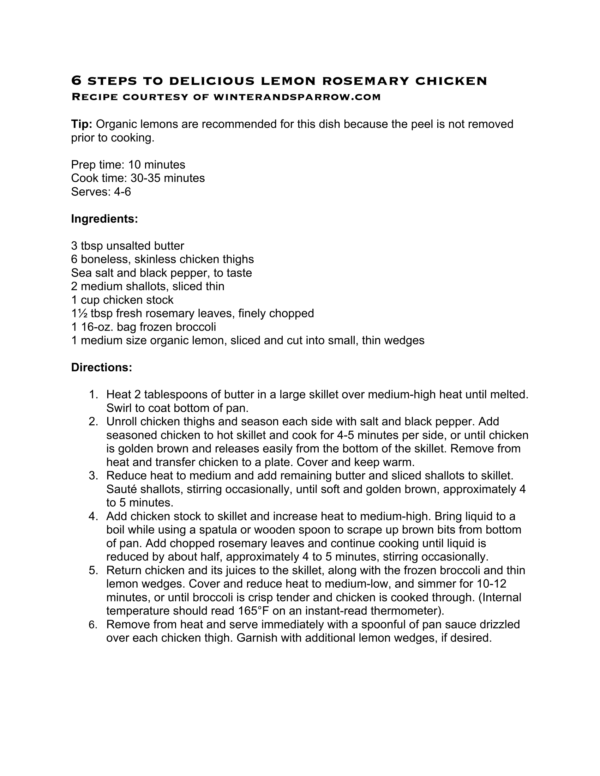 If lemon rosemary chicken isn’t your thing, check out our recipe for Braised Chicken with Portobello Mushrooms.